The Force Index was developed by Dr. Alexander Elder and measures the power behind a price move using price and volume. The indicator is primarily used used to detect divergences but can also be used for trend confirmation. 1. Direction – If prices move up during a period, it indicates that buyers are stronger than sellers. Conversely, if prices move down sellers are stronger than buyers. 2. Extent – Significant price moves shows high levels of buying or selling pressure. 3. 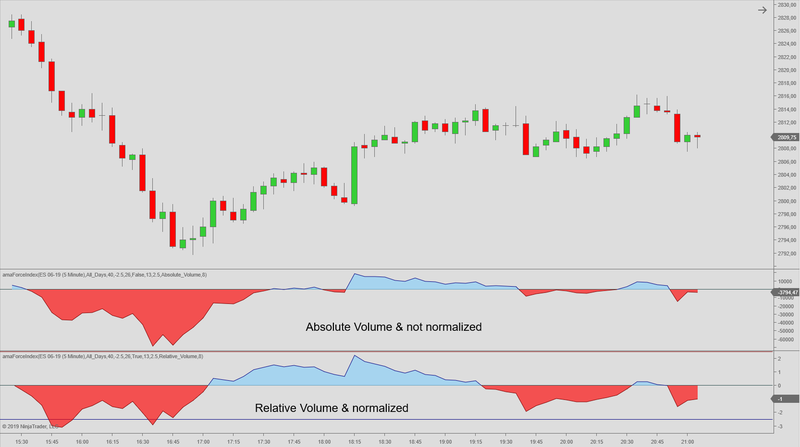 Volume – High volume shows a strong commitment underlying the price movement. Our version of the Force Index comes with the option of calculating with Relative Volume. The oscillator values can furthermore be normalized.